The timing could not be worse. While a majority of people in Indonesia have barely recovered from the horror that came from witnessing another massive earthquake and rescue workers still dig up the rubble to find survivors, people were sidetracked by a spectacle of shame. It’s one of those moments when politics rear its ugly head and we are once again reminded that politicians could do the worst thing imaginable to just score a political point. Political activist Ratna Sarumpaet has been known for her histrionics, which she has executed mostly to draw people’s attention to her staunch opposition to incumbent President Joko “Jokowi” Widodo. Most of the antics have been petty, like when she was caught on camera threatening city parking officers who impounded her car, in April, for wrong parking. Most political watchers had a feeling of schadenfreude when her political stunt of turning up at a meeting between Minister Luhut Pandjaitan and family members of those who perished in a boat accident in Lake Toba, North Sumatra, backfired. When she tried to intervene in the conversation, she was scolded by the bereaved family members and escorted out of the meeting. She was alleged to have exploited the tragedy for her own political benefit. But what she did this early October was a new low, even for her. It began with a photo of her swollen face circulating online, followed by her claim that she was assaulted for political reasons. Many in the camp of President Jokowi’s rival, Prabowo Subianto, quickly jumped to her defense. A number of senior politicians from Prabowo’s Gerindra Party, including deputy speakers of the House of Representatives quickly backed Ratna’s claim and deemed the “assault” as politically-motivated and said that Ratna has long been targeted for her vocal opposition towards the President. The only problem is that the “assault” never took place and Ratna was lying about the episode. Her swollen face turned out to be the result of a liposuction procedure taking place in a hospital in Central Jakarta. Politicians lie all the time, but this liposuction scandal is an abomination simply because it took away our attention from what mattered most. More air time and discussion on social media should have been devoted to helping the quake victims in Central Sulawesi, but instead we wasted so much energy on finding out if Ratna regularly went under the knife or if she paid the procedure using money donated to victims of the said boat accident. But desperate times need desperate measures and politicians do what they must. A quick look at current public opinion polls could help us shed light on the shameful episode. In its latest public opinion survey, a highly regarded Jakarta-based pollster found that incumbent President Jokowi has an unassailable lead in the poll, with 60.2 per cent, while his challenger Prabowo, a former Indonesian Military (TNI) general had his popularity slide even further, down from 33.2 per cent in May to 28.7 per cent in September this year. To make things worse for Prabowo, almost 63 per cent of voters thought President Jokowi has done a good job in improving the country’s security while another 40 per cent think that the country’s economy is in a better shape compared to the same period last year. Given the current state of the race, it is easy to see why Prabowo and his team was quick to seize Ratna’s claim of assault. The brouhaha over Ratna’s liposuction scandal was in fact the biggest story involving Prabowo since the start of the presidential campaigning period which kicked off on September 23. In fact, the political campaigning has been a low-key affair and beyond the news of Prabowo and his running mate, businessman and the erstwhile deputy governor of Jakarta Sandiaga Uno visiting traditional Islamic boarding schools (pesantren), there’s nothing that the national media could print about them. While the pair was languishing, Jokowi was basking in the success of the Asian Games where he managed to paint himself as a youthful leader of a young nation trying to achieve global success. If anything, throughout 2018 Jokowi has masterfully created a public relation campaign that painted him as the only politician who could lead the country in the next five years. This campaign has been so successful that President Jokowi was reluctant to make any move that could hurt his record. 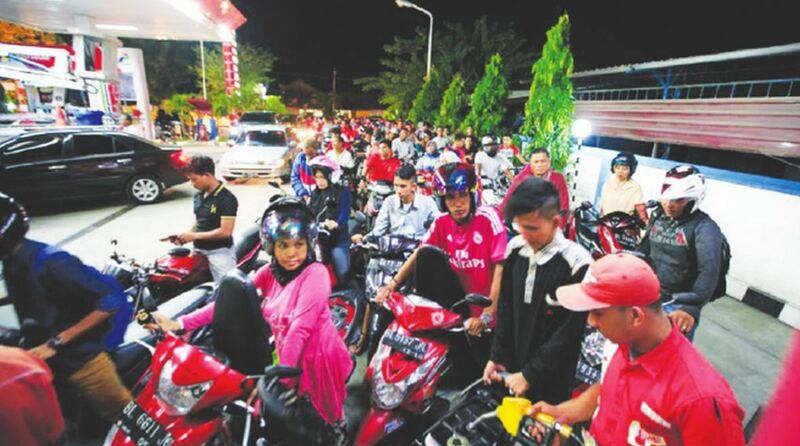 The government’s flip-flop on raising the price of fuel resulted from this careful consideration. Throughout his tenure, Jokowi has gone an extra mile to make sure that prices of basic goods should be kept at a reasonable level, even if that means the government had to pay for a hefty subsidy. The stakes have never been this high. For both sides. The writer is Managing Editor at The Jakarta Post, Indonesia. The Asian Writers’ Circle is a series of columns on global affairs written by top editors and writers from members of the Asia News Network and published in newspapers, websites and social media platforms across the region.